Exactly what I was looking for! Great quality! This polypropylene, power-loomed rug, with its majestic motif, will give your space a graceful, dainty touch that won't overpower your other décor pieces. It features a pink, grey, and ivory color palette that adds to its delicate look. The half-inch pile was constructed for both durability and softness while also boasting a subtle shine. Show this exquisite rug off in your living or dining room. 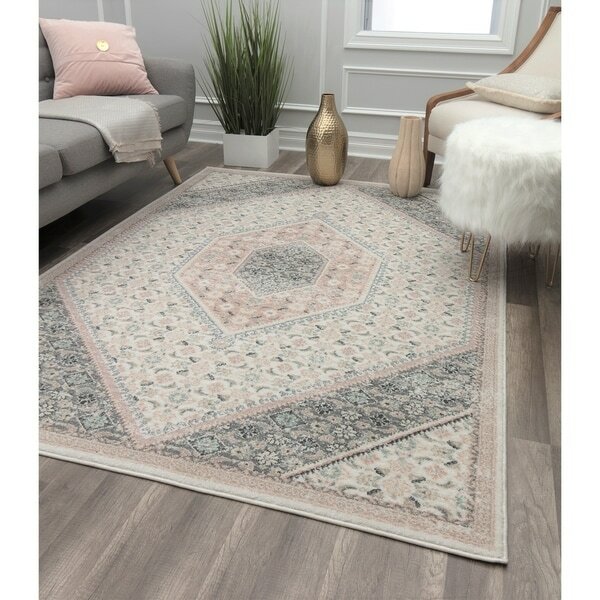 The colors in this rug are beautiful and muted enough that everything in the room blends perfectly with it. It was the perfect final touch for my sitting area. I love it! Love the color, I'm doing this in my bedroom. Less expensive than other places I have seen it.